Wash the rice with water. Drain the water, keep rice aside. Wash mutton add ginger garlic paste and salt. Mix well. Make small balls of 1 inch in size. Deep fry in oil. (you can even coat in dry cornflour and fry. I like to do both ways). Fry all balls and keep it aside. Heat the thick bottom non stick sauce pan. Add leftover oil (2 tbsp)used for frying mutton balls. After it becomes hot add bay leaves, pepper, cloves, onion and tomato. After onion turns golden in colour add green chilies, ginger garlic paste, coconut paste and turmeric powder. Saute for few minutes. Add rice and saute for about 7-8 min till it becomes dry on medium flame. Then add garam masala saute for 2-3 min. Then add hot water and salt to the rice, stir well. Cover with the lid keep the high flame for about 4-5 min. You will observe that most of the water is soaked by the rice. Then remove the lid stir rice upside down very carefully otherwise rice will get broken. Keep the low flame and cook it for about 8-10 min. 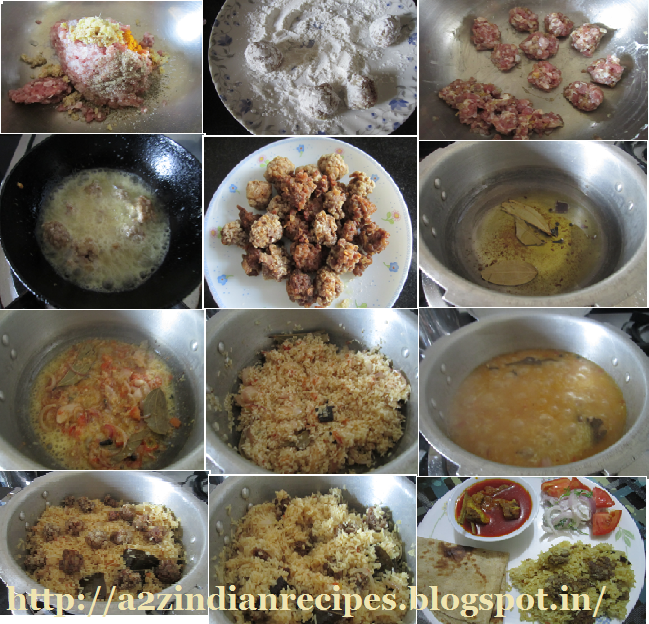 Then add mutton balls, mix well rice. Keep for another 4-5 min. Switch off flame. Serve hot with mutton curry.